Think cheese-it meets goldfish meets homemade flavor explosion! Just a few simple ingredients you can find locally. I promise you can’t eat just one…handful…Here it is, our cheese puffs recipe. Delicious snack for kids and grown- ups without all the additives. Mix 1 c flour, 3.5 T butter, and 5 oz grated cheese, until the mixture is a fine crumb. Add just enough cold water to form into a ball, and chill. Then just roll, cut, and cook at 400 F until golden. So easy! And you can use any hard cheese you like, so have fun experimenting with flavors. I really wish I could do justice in a photograph to the layers of crumbly puff you get in these crackers. I guess you will just have to try them yourself! 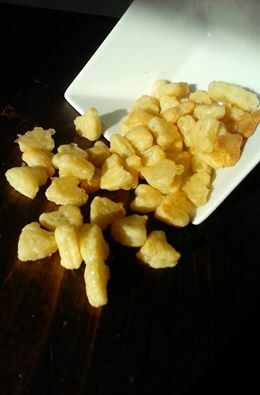 Posted on February 24, 2015 February 24, 2015 by wensleydalecottageTagged cheese crackers, cheese puffs, cheeseits, goldfish, homemade cheese it, homemade goldfish.